How much does it cost and how much space do you need? 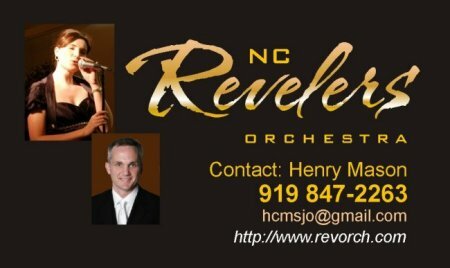 The NC Revelers are a great choice to bring excitement and a memorable difference to your next event. We provide quality entertainment for your party, adding an element of "showbiz" usually associated with the heyday of Hollywood or Las Vegas. Wedding receptions, fundraising events, special dances, conventions, trade shows, private parties, concerts...you name it, we can handle it. If your event is something we are not a good fit for we will tell you up front and try to assist you in finding the entertainment you need. 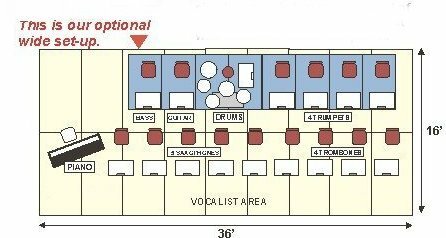 As to space we usually ask for a 24 x 24 foot stage area, but in general we can fit anywhere a normal sized rock band fits. Our equipment is different but takes up no more room. We have had a lot of practice fitting where we need to be. For details on booking call Henry and he will set everything up for you and answer any questions. In general we cost no more than many rock bands or specialized wedding bands. It is a good idea to plan as far ahead as you can. Popular dates (Christmas, New Year's Eve, Valentines Day, etc.) can book pretty early. Securing a confirmed booking date now will prevent disappointment. Events are booked most often for two, three or four-hour events (this includes one customary break per hour). Most concert performances are two hours. Prices are based on the specific times and needs of your event. If the proposed performance venue is located more than two hour's driving time from Raleigh, there may be a surcharge for transportation (bus rental) and/or overnight accommodations. We will be happy to quote a definite price as soon as we know the exact requirements of the engagement (how long, how far, etc.). Our band setup is the same as that of the great road orchestras of Les Brown, Tommy Dorsey, Glenn Miller and Count Basie. There are two basic configurations. Normally the band prefers to set up in three rows in a 24 foot square area. 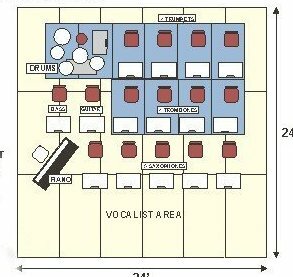 In some venues an optional wide setup may be necessary and the requirement for this is 36 feet wide but only 16 feet deep. Our set-up crew must have access to the performance site at least two hours prior to the event, and for at least two hours after the event for removal of our equipment and staging. This site best viewed at a resolution of 800 x 600 or higher.